Dr. Michael Kenny, emeritus professor in the Department of Sociology and Anthropology at Simon Fraser University, recently completed a term as Resident Scholar in the Oregon State University Libraries Special Collections and Archives Research Center. Kenny is the twenty-fourth individual to have conducted work at OSU under the auspices of this program. Part of Kenny’s scholarly background is in the eugenics movement, and it is this prism that framed his interest in conducting research in the Pauling Papers. Kenny was specifically interested in investigating the changing cultural milieu in which Linus Pauling worked and the ways that this environment may have impacted Pauling’s thinking on issues associated with eugenics. Kenny was likewise very keen to examine the rhetoric that Pauling used during the years in which the dangers of nuclear fallout were an item of active debate. As it turns out, much of this rhetoric assumed a tone similar to that used by eugenicists contemporary to Pauling. That said, with Pauling and certain of these contemporaries, the use of this rhetoric was not motivated by anything like the ideals that we now commonly associate with the eugenics movement of the early twentieth century. In his research, Kenny leaned in part on a secondary source, Lily Kay’s The Molecular Vision of Life (1993), which examined the development of molecular biology at Caltech during its infancy in the 1930s. Pauling was a central figure in this important chapter of scientific history, having shifted his research program to focus on “the science of life” – specifically, the determination of various protein structures – as funded during the Depression years by the Rockefeller Foundation. One major outcome of Pauling’s research on protein structures was his discovery that sickle cell anemia is a molecular disease. This work was conducted in parallel to similar investigations carried out by the human geneticist James V. Neel, a major twentieth century scientist who discovered that sickled cells are the result of a heterozygous mutation that, when it becomes homozygous, leads to sickle cell disease. For Kenny, James Neel provides a bridge of sorts in the scholarly analysis of Pauling. In addition to his work on sickle cell traits, Neel also was involved in ethnographic research on the indigenous Yanomami population in Brazil. This study was funded by the United States Atomic Energy Commission in the late 1950s and early 1960s, and was motivated by the U.S. government’s desire to more fully understand the consequences that atmospheric radiation might portend for the human gene pool. The debate over radioactive fallout from nuclear weapons tests during this time was fierce and continually hamstrung by a lack of concrete data. 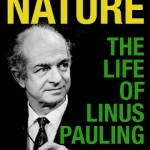 Linus Pauling, of course, was a key figure in the debate, and as Kenny and others have pointed out, he and his opponents used essentially the same data to draw very different conclusions from one another. Indeed, both sides were effectively engaging in the politics of risk assessment in arguing over the likely genetic implications for future generations of radioactive fallout released into the atmosphere by the nuclear testing programs of the era. In developing and espousing his strong anti-testing point of view, Pauling was heavily influenced by Hermann Muller, a Nobel Laureate geneticist who is perhaps best known for proving the mutagenic effects of x-rays on fruit flies. According to Kenny, Muller was pretty clearly a eugenicist who spoke often of the need to maintain the purity of the pool of human germ plasm. For Muller, essentially all mutations caused by radiation were to be viewed as a negative. While he acknowledged that natural selection is indeed the result of mutations that occur over the course of time, Muller believed that an increase in the rate of mutation is very likely to result in negative consequences. In arguing this, Muller pointed out that many mutations are buried and do not emerge until specific reproductive combinations come to pass. As Pauling and James Neel showed in the 1940s, sickle cell anemia is one such situation where this is the case. Natural selection is cruel and man has not outgrown it. The problem is not to be solved by increasing mutation rate and thus increasing the number of defective children born, but rather by finding some acceptable replacement for natural selection. For Kenny, Pauling’s suggestion of a possible replacement for natural selection anticipated contemporary techniques that are now deployed to minimize or negate what would otherwise be devastating hereditary diseases in newborn children. For expectant parents currently opting in favor of genetic counseling, as for Pauling in his day, the goal is to minimize the amount of human suffering in the world, not by proscription or law, but by choice. This ambition, which is global and cosmopolitan in nature – and not dissimilar to contemporary activism concerning global climate change – stands in stark contrast to the racist or nationalist motivations that fueled the eugenics of a different era. For more on the Resident Scholar Program at the OSU Libraries, see the program’s homepage.